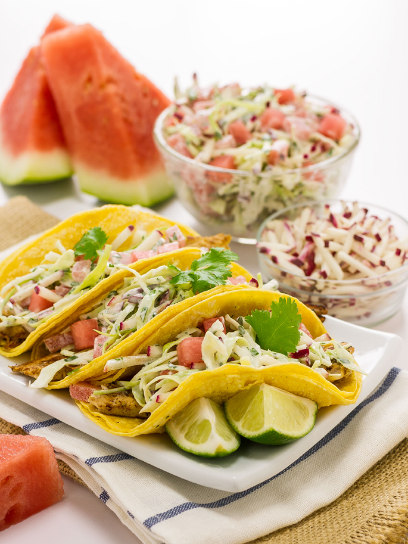 RECIPE: SKINNY FISH TACOS WITH WATERMELON AND RADISH SLAW - What About Watermelon? During my 2015 New Year’s resolution of trying new and different watermelon recipes, I learned a lot about my taste buds and my culinary preferences. As a former competitive eater, it’s no secret that I love to eat, but I’m a little picky when it comes to what I actually consumer during a “normal” meal. Last year, I made a point to find recipes that I wouldn’t try otherwise. Like this one for Skinny Fish Tacos. These tacos taste so good, you will totally forget that they’re “skinny,” which often means that the best ingredients are missing or short-changed with low-fat options. But there’s no short-changing with this recipe. The result is a taco that’s as good as any regular one, only these tacos are “skinny,” which means you can eat more than one without feeling guilty. Topped with a creamy watermelon and radish slaw, you won’t be able to resist them. Place fish in a freezer bag with olive oil, 3 tablespoons lime juice, honey, garlic, chili powder, cumin and cayenne pepper. Close bag and coat fish completely. Marinate for 15-20 minutes at room temperature. Place fish on a broiler pan and lightly season with salt and pepper. Place fish under broiler for 5 minutes. Turn fish over and cook for an additional 2-5 minutes or until it easily flakes. Remove fish. Wrap tortillas in aluminum foil and place in oven, which has been turned off, to warm. Meanwhile, add Greek yogurt, mayonnaise and lime juice to a bowl. Stir until combined. Add cabbage, radishes and cilantro. Toss lightly. Add watermelon and salt to taste. Toss lightly. Remove tortillas from oven. Place pieces of fish on two tortillas. Top with slaw. Garnish with extra cilantro. Serve warm. HOW TO MAKE: WATERMELON RICE KRISPIE TREATS! wow. This looks so delicious. I’ll try doing it when I have free tim. Thanks for your sharing!